Mugshots of suspects. Photo courtesy of Huntington Beach Police Department. Two Los Angeles men were arrested in Long Beach Thursday afternoon following an attempted break-in in Huntington Beach and a pursuit over county lines, authorities said. 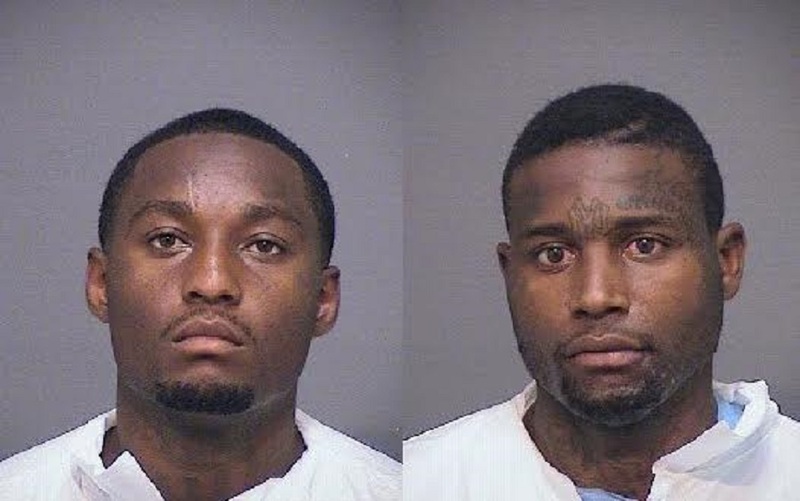 Ronnie Lloyd, 22, and Enman Evans, 21, were arrested for burglary, resisting arrest, felony evading, false identification to a police officer and violation of parole. According to Huntington Beach Police Department (HBPD) officials, two Huntington Beach residents came to their house on the 16000 block of Greenview Lane at 12:30PM on Thursday, August 6, and saw two males trying to break in. They then proceeded to call police and provide descriptions of the suspects, the vehicle they were seen leaving in and a license plate, authorities said. Police located and attempted to stop the vehicle several miles away, near the Garden Grove (22) Freeway, but the suspects did not stop. A pursuit then ensued and continued on to several freeways with an HBPD helicopter following the vehicle until it crashed at the Long Beach (710) and Gardena (91) Freeway off-ramp. The suspects fled after the crash and were eventually caught, officials said. One suspect was located and detained almost immediately while the other suspect was arrested two and a half hours later after hiding in a trucking company building.